In the morning the lights of Damietta came into view. As we approached Port Said and could already discern the city, the pilot appeared to guide “SMS Elisabeth” into the harbor. We saluted the Egyptian flag with 21 rounds which was answered by a battery on land. The Egyptian artillerists looked splendid in their English tailored black uniforms with red trouser stripes (Lampassen). Near our consulate we docked just in front of a large English East India ship at a buoy. In the harbor lay an English gunboat and multiple large, mostly English steamboats that replenished their coal stocks as fast as possible in order to continue their journey through the Suez Canal. Port Said is truly a harbor where no ship stays longer than necessary: Coal and provisions are restocked, the mail posted, the pilot embarked and on towards the next stop they go. During our arrival, there were all kinds of people on the dock who were interested to have a look at the mighty warship – English officers, seamen, Arabs, Fellahs, Indians, Jews and travelers from the East India ship. Our consul as well as consul general baron Heidler who had come from Cairo greeted me. The latter reported that the Khedive had sent his nephew and also general adjutant, Prince Fuad Pasha, to welcome me in remembrance of the friendly reception in Vienna during his visit there, despite my traveling completely incognito. As soon as I had put on my gala uniform, the prince came on board to the music of the Egyptian anthem and offered me a welcome in the lands of the Pharaoh in the Khedive’s name. Prince Fuad Pasha displayed exquisite manners and a thorough European education. We talked for a good time and I later returned his visit at his hotel. The rest of the day was to be alloted to a hunting expedition to Lake Menzaleh, organized by the consul and the pasha of Port Said. I have to admit that I had little confidence for the success of this venture as such hunts with intense participation of the locals tend to create much noise and cost lots of baksheesh but result in a very small haul. I have collected many experiences of such events during my first voyage to the orient. Fortunately, I was to be pleasantly disappointed this time. The ceremonial boat transported us some distance into the canal where the pasha and a number of his supervisors of the communes around Lake Menzaleh received us. The handsome, strong men wore heavily pleated, colourful burnous. The good pasha made a sweet-sour face being rather downcast: The organization of the hunt would be his last act in office which was at an end because of his often called “oriental” ideas about debit and credit in the accounts. Three skiffs were ready at the lake shore and we were soon swarmed by the locals who wanted to carry us the few steps to the skiffs. Four flamingos with wings were living a peaceful life near a small hut and were driven back there by a small boy every time they tried to escape. To my surprise, a local suddenly grabbed these flamingos and took them onto one of the skiffs. It seems they were intended to lure other birds to the skiffs. The locals were shouting a lot, while we were finally being assigned to the individual skiffs. The placement of the pasha and his entourage proved to be difficult; riding on the shoulders of two Arabs, he proceeded from one skiff to the next until he finally found his place in the consul’s skiff. The consular kavass (constable/armed servant) Ahmed who had traveled with me through Palestine and Syria during my first voyage to the orient served as my interpreter. After much noise and cursing we were finally afloat. In the first skiff were I and Wurmbrand, in the second Clam and Prónay, the rear guard was composed by the gentlemen of the consular corps, the pasha and the rest of the hunting entourage. Far away, near the horizon, we were seeing many hundreds of flamingos that were standing in the low brackish water in long lines glistering rose-red. Such a chain of flamingos offers the hunter as well as the ornithologist a magnificent view. At first, the eye only notices a light rose-red long strip until the observer, having approached close enough, distinguishes more clearly individual animals, their long, mostly S shaped neck, the long legs and the limber body, the crimson red males and the much lighter colored females as well as their offspring. If a whole flock of these magnificent birds lifts itself up into the air with a tempestuous sough, then the overall image is even more captivating as the flamingos stretch out their long necks and legs horizontally and the intensively colored plumage below the wings is shown to their fullest advantage. Such a flock resembles a red cloud. Besides the flamingos, multiple flocks of coots, grebes, pochards, ferruginous ducks and Northern pintails were swimming in the lake. Individual flights of sandpipers passed and harriers as well as falcons pounced gracefully upon the flocks of ducks that sought their fortune in quick flight. At first, I intended to go for the closest flock of flamingos. We were cowering in the skiff while two locals, wading in the water, pushed us in front of them. Rifle and shotgun were ready; slowly advancing with anxious alertness we were observing the closest flamingos that were acting like outlooks in front of their flocks. Finally a perturbation rippled through the flock; all necks were strained; the foremost birds started to advance a few steps and lift themselves into the air with heavy flapping wings. Now, there is no time to lose. Although we had approached to only about 180 paces, I tried a rifle shot that, too short, caught one flamingo in its leg but didn’t down it. With a great tumult, the whole flock started to lift itself into the air and took off in a long line. At this moment I saw a single beautiful male bird at around 300 paces high up in the air and dared, without hope of success, a rifle shot with a lead of around 1 m. As struck by lightning, hit squarely into its chest, the flamingo crashed down into the water. To my joy, an Arab brought the fine specimen to my boat and handed me the bird with a big grin. Two more times, we tried to approach the timid animals; once with two skiffs at the same time, firing a salvo which netted both Wurmbrand and Clam a flamingo each. Then the birds set out into unreachable heights; all flocks combined and departed eastwards over the canal. Afterwards, we occupied ourselves some time with the rest of the water wild life. We bagged many ducks and grebes and then returned back to land as the sun was setting. We said good-bye to the doleful pasha and traveled back on board “ SMS Elisabeth”. Before the dinner we undertook a short stroll in the nothing less than attractive Port Said and did some shopping, mostly cigarettes and different oriental objects. The shopping mania that so easily captures the traveler in foreign countries is peculiar. He feels compelled to buy small things, whether beautiful or ugly or even cheap bric-a-brac, only to have something characteristic of the place in question to bring home, as if it was necessary to offer touchable proof of one’s visit of foreign countries. Such it arrived to us at Port Said where we gave in to our shopping spree. Laden with the most useless stuff, paid far too much over its value, we left the bazaars and filled our cabins that did not have much room to spare in the first place with the goods acquired. ANNO – on 20.12.1892 in Austria’s newspapers. The Bregenzer Tagsblatt informs its readers that diamond thefts are on the rise. The Linzer Volksblatt is pleased to inform its readers that Steyr will install an electric power generator given that 3000 light bulbs have been subscribed to by the public as well as the capacity demanded by the local weapons factory. The k.u.k Hoftheater is playing Goethe’s Faust, Part I.
Dieser Beitrag wurde am 20. December 2018 von wordpressadmin in diary veröffentlicht. Schlagworte: Egypt, hunting, Mediterranean Sea, Port Said, shopping. During the night the northeast wind had stiffened considerably. “Elisabeth” was rolling strongly, in the cabins, some of the during the day improperly fixated objects were performing a true witches’ dance. When I came to the bridge at 6 o’clock in the morning, the officer of the watch reported that the sea had been stormy during the night. The rolling continued during the full morning even though the wind calmed down. 22 degree Celsius. Today, no land was visible, for the first time we saw but sky and water during the whole day. 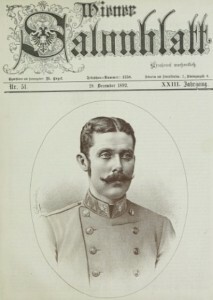 ANNO – on 19.12.1892 in Austria’s newspapers. The Neue Freie Presse mentions that the Emperor, Archduke Ferdinand of Tuscany, Archduke Leopold Salvator and Prince Louis of Bavaria spent Franz Ferdinand’s birthday on the train departing at 2.45 pm to a hunting retreat. They will return on the 21st December 1892. Hunting is dangerous: The Neue Freie Presse notes that Baron Alphonse Rothschild has been hit in the eye by a piece of lead from the hunting rifle’s recoil on 18th December 1892 in France. A special private telegram from Paris informs that the eye is not fatally threatened. The doctors recommend 14 days‘ rest in bed to recover. The Wiener Vivarium advertises talking parrots and domesticated apes as Christmas presents. Dieser Beitrag wurde am 19. December 2018 von wordpressadmin in diary veröffentlicht. Schlagworte: December, Mediterranean Sea, on ship. Already while waking up, I noticed that the sea must be running high as rolling movements were felt strongly in the cabin. After having tediously dressed myself with the assistance of a marine servant, I went on deck where I met many a distraught face as Father Neptune demanded his first victims. A stiff breeze was coming from the North-East and wave upon wave crashed upon the deck. Otherwise the day was clear and the sky above us painted in an intense blue. In the morning, the assigned meeting of the staff and the mass in the battery had to be canceled due to the strong rolling motions; only at noon, when we arrived near Crete, was the sea calming down. We changed our course slightly and navigated alongside the coast of Crete and between it and the island of Gavdos. Crete offers picturesque scenic sights. The peaks of Mount Ida at up to 2457m crowned the view, while steep rocky sides fall off towards the sea. The island seems to be almost as poor in vegetation as in human settlements, despite their numerous markings on the map. Only on a few prominent spots were visible small white buildings, apparently monasteries or churches. The snow on Mount Ida, reaching far down, the violet-red illumination of the mountains and the deep blue sky united into a powerful panorama. After lunch, a raffle (tombola) for the crew was arranged as a Sunday distraction for which all the off-duty crews had assembled on the middle deck. Our good boatswain – the good old school type, with a certain animosity against all modern maritime fixtures – called out the numbers in the manner that he combined each number with an Italian joke word what caused much amusement. Wine, cigars and other trinkets served as prizes. In the evening, a procession in honour of my birthday was organized by the sailors. The procession was very successful and amusing, attesting to the humour and imagination of our peoples. With the simplest means such as flax tow, grime, broken belts, fish hooks and so on, they managed to achieve the funniest effects. Behind the music band marched in first position an Italian choir that produced a number of well-tempered songs; then followed a Bohemian music band, dressed in various uniforms borrowed from the cadets, that played the known song „Nejde to“ in the most audacious modulations. At the same time, an animal tamer lead a large group of lions, apes, elephants and camels. The elephants were especially imaginatively constructed: a two-man team had covered themselves with a tarred gun cover and used the barrel protection as its trunk. A very uncanny beast with a moving mouth studded with teeth, a crossbreed between a marabou and a crocodile had been born in the shoemaker’s workshop. A Schrammel quartet filled the air with real Viennese melodies. In conclusion a magnificent chieftain led a horde of jet black Zulu kaffirs who shivered in the cold faced with the stiff north east breeze dressed only in their swimming trunks and a coat of grime. The savages carrying a banner with my name roared “hurrah” and danced lustily. Their lively movements warmed them somewhat up in their skimpy dress. As the music incidentally used the common rhythm of a jolly polka all the sailors were dancing pair-wise in rounds. The easy gaiety of our sailors made a favourable impression. Given the severe even harsh and dangerous demands of the service, this can be seen as a proof of the physical and psychological sanity of the crew and also attributed to the good influence of a well-regulated military lifestyle. It is good to see how the members of the most diverse nationalities and countries share a common bond. Germans from Lower Austria, namely from Vienna, from Upper Austria, Salzburg, Styria and from other countries, Slavs from Bohemia, the Croatian coast and from Dalmatia, Italians and Hungarians are fully intermingled. Notwithstanding the individual nationality, the polyglot crew feels to be joined together to form a part of the service under one proud and glorious flag. This nurtures and strengthens the awareness of the union of all nationalities under own ruling family and in one common fatherland – certainly an educational outcome of military service that can not be cultivated and promoted too carefully enough. ANNO – on 18.12.1892 in Austria’s newspapers. This being Franz Ferdinand’s birthday, the newspapers naturally congratulated. The Wiener Salonblatt opened with a portrait of Franz Ferdinand and informed its readers about Franz Ferdinand’s departure from Trieste and announced his predicted arrival date at Port Said in Egypt on 20th December. Dieser Beitrag wurde am 18. December 2018 von wordpressadmin in diary veröffentlicht. Schlagworte: December, Mediterranean Sea, on ship. During the night, the strong Bora wind made the sea rise: the heavily rolling ship dislocated many objects that hit the walls. The noise made us get up at 3 o’clock in the morning. The morning weather, however, turned out beautiful and the sea was calmer but still choppy from a North-eastern wind. At 8 o’clock, we had arrived alongside Corfu and saw the wonderful Albanian mountains in the distance. In the afternoon, we passed Kephalonia that had never played a historical role but still had its own moving history. Only a small canal was separating it from Ithaka, known to classicists. We could make out the distinct shape of Kephalonia despite the distance of several miles from the coast; later appeared Zante, the flower of the Levant. The setting sun created colorful effects that reminded me of the southern sky on the stony mountains on whose flanks little hamlets with olive orchards and vineyards were situated. In the evening I was surprised by a premature birthday celebration. A tattoo was beat. The crew shouted „Hurrah“, an improvised firework started. Rocket upon rocket went up into the star spangled sky straight as an arrow, while signal lights illuminated the deck clear as day. ANNO – on 17.12.1892 in Austria’s newspapers. The Neue Freie Presse hotly discusses the government’s initiatives regarding certificates of proficiency (first introduced in 1883). In Paris, the Panama Canal Company scandal is in full force. Charles de Lesseps and his co-defendants were escorted to the Mazas prison on the evening of 16 December 1892. Ferdinand de Lesseps, staying at Le Chesnay Palace, will stay at liberty, for the moment. It is announced that Vienna’s first grand Hofburg ball will take place on 9 January 1893. Vienna’s K. und k. Hof-Burgtheater offered a comedy “Gönnerschaften” (Patronages). The K. und k. Hof-Operntheater played the comic opera “Gute Nacht, Herr Pantalon”. Dieser Beitrag wurde am 17. December 2018 von wordpressadmin in diary veröffentlicht. Schlagworte: December, Mediterranean Sea, on ship.